When Collins moved to Los Angeles in the late 1980s, she arrived with no resources besides her talent, work ethic, and a passion to paint what had inspired and sustained her throughout her childhood: the soul of the horse. During a difficult upbringing, Collins found her greatest teacher in a disabled horse named Chief. He provided her with many life lessons, becoming her personal metaphor for unconditional love. With this passion as her driving force, the young Collins worked odd jobs while often homeless, living on abandoned boats and the floors of tiny studios. Despite repeated dismissals by the contemporary art world as a female artist creating equine-inspired works, Collins persevered. In her early 20s, she sold her first painting and immediately gave half of her earnings to charity. As her success continued to rise, she expanded her charitable work into a worldwide, hands-on focus: working to prevent human trafficking, providing for orphans, building schools, supporting cancer research, and protecting wild horses and abandoned pets. 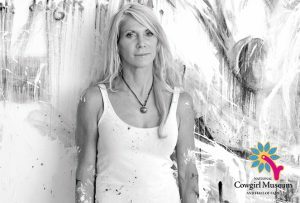 Now an internationally successful contemporary painter, she is recognized for her powerful, large-scale paintings. Collins’ layered works incorporate portions of horse silhouettes along with vintage photographs, pages of literature, and postcards. Her emotionally charged pieces are in hundreds of private and public collections worldwide.